In 1931, Sergei Eisenstein described montage as "an idea that arises from the collision of independent shots" wherein "each sequential element is perceived not next to the other, but on top of the other." This layering of images allows them to combine, producing a third meaning that was not present before their combination. 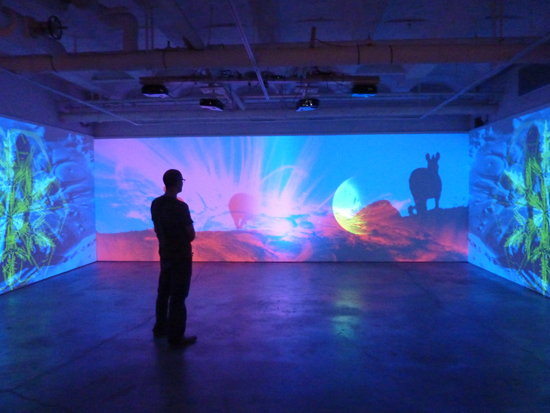 "Ouroboros" - a video exhibition currently on display at the ISE Cultural Foundation - takes the aesthetics of early montage and hits fast-forward in 3D. By modifying a version of chromadepth into a process they call COLORSPACE, art collective SWEATSHOPPE achieves a layered 3D effect in which red, green, and blue (RGB) are each visible at a different depth from the surface on which they are projected. The effect is a complex sequence of images projected simultaneously and layered on top of one another to create an almost literal manifestation of Eisenstein's montage aesthetic. The sequence combines over 30,000 images selected by artist Ali Hossani, and is meant to tell the story of cosmic evolution, "from the Big Bang to Lady Gaga." The images read more like the infamous montage sequence in A Parallax View (1974) than a statement on the rejoinder of art and science where "knowledge, desire, and energy meets the limits of human freedom," as the artist's statement suggests. Still, the effect is mesmerizing, and showcases one of several new possibilities for 3D technologies in the creation of a new digital aesthetic.